If you know your colors and your fonts, and have a logo, that’s going to go a long way toward making the collaboration with a web designer easier and more enjoyable. Your branding tells potential customers who they’re working with, it communicates a bit of your personality and all about your company. This part can take time, but it’s important. You don’t want to rush through your branding. There’s always room for redesigns, but bad branding gets you nowhere. First impressions can be hard to change. The elements discussed in point 1 are a great start, but if you don’t have your content complete and have at least some idea of how you want it laid out, that limits the effectiveness of the hard work you’ve done to choose colors, fonts and other branding elements. When you know what content you have and have at least a sense of how you want it ordered, that pumps up the power of a design. A web designer can’t put together a website without your finished content, but I might go as far as to say that we don’t particularly enjoy working that way. Finished content can affect the look of a web site and its overall design. Of course, we can use dummy content, but that won’t show you what the final product is going to look like or if your content is even going to fit on the website. When your site is designed around your content and organized the way you want it to be, it’ll shine. 3) A List of Sites that Inspire Your Vibe. There’s no good that comes from copying, but you can give a designer a list of sites that keep you coming back. When you can explain why you keep going back, that helps your designer to create the kind of vibe you’re looking for. A great designer can take the bits and pieces of sites that inspire you and combine them with your content and your branding to create an unforgettable website and experience for your customers, clients, and visitors. If you can tell a designer what you like and how you picture it working for you, it helps to ensure that you get a design you love. To be effective, each page of your website should have a goal. If you want to book more clients, get more page views, or get people into a sales funnel, it’s important for a designer to know. There are ways that a designer can put your pages together to make your goals easier to achieve. 5) An Idea of Your Intended Functionality. If you sell products, you’ll probably want customers to be able to purchase items directly from your website. This means you need a shopping cart and a way to accept payments. If your website functions as a blog but you don’t sell anything, you’ll not need the same elements. When you know how you want your website to function and things you want people to be able to do, it changes the scope of the project, and changes the work that a designer needs to do. 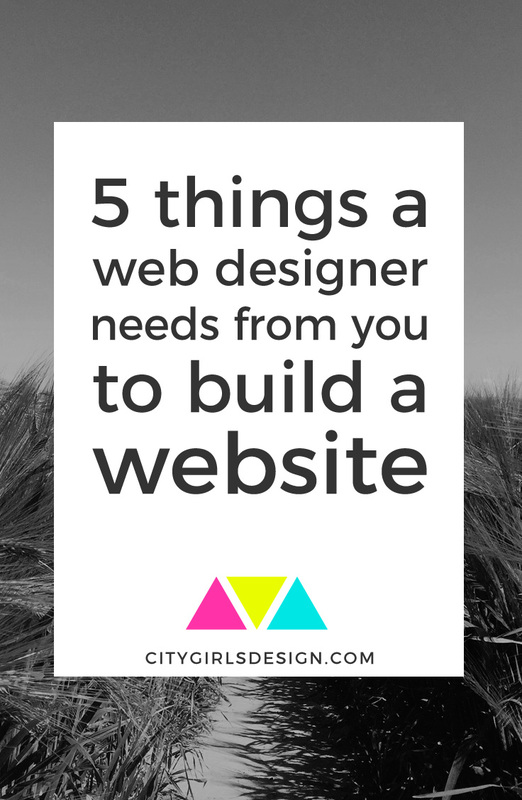 Knowing this ahead of time can speed up your project and help you to get a web site you’re proud of. If you’re interested in getting a custom designed web site, CityGirl’s Designs is glad to help! Click this link to get a custom quote, or this link to learn more about what I do and why I do it!